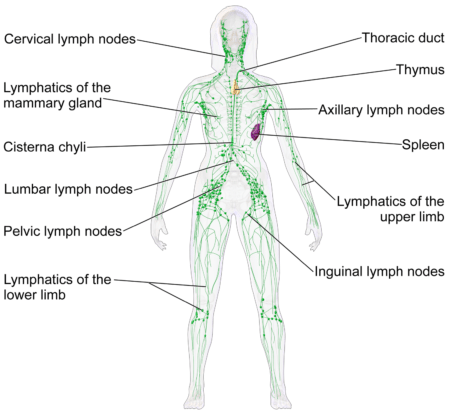 The lymphatic system is a network of thin tubular vessels that branches out to almost all parts of the body. Scattered in between these vessels are lymph nodes. The job of the lymphatic system is to fight infection and disease. Cancer of the lymphatic system is called lymphoma. Hodgkins is one of two main types of lymphoma with non-Hodgkins being the other. Lymphoma, or “cancer of the lymph glands” is usually very responsive to chemotherapy and radiation, and often curable. According to the American Cancer Society, lymphoma is divided into two basic categories: Hodgkin’s Lymphoma (sometimes called Hodgkin’s Disease) and Non-Hodgkin’s Lymphoma. Treatment of these two “cancers” is similar, but not identical. There are multiple types of lymphoma, and some risk factors include gender, age, race and geography. Males are more likely to develop lymphoma than females, African Americans and Asian Americans are less likely to develop lymphoma than white individuals. It’s important to understand that having a lymphoma risk factor does not mean you will develop this type of cancer. Symptoms of Lymphoma will vary based on type, stage and where is it located in the body. Some people will not experience symptoms until the cancer has grown. In its stages one and two, Lymphoma is in its early stage. As the disease progresses to three and four it is classified as advanced lymphoma. Early diagnosis and treatment often lead to a better disease prognosis. If you, a friend or family member are experiencing symptoms of lymphoma, it’s important to contact your doctor for an evaluation. A person may visit their doctor because they have noticed a bump that has not gone away over a period of time. Your doctor will review your medical history and gather information regarding symptoms, other medical conditions and possible risk factors. During the exam, your doctor will focus on your lymph nodes, and other areas of your body that may be affected. Blood tests can help determine if, and what type, of lymphoma a person has. An additional method used to diagnose lymphoma a biopsy of the swollen lymph node. It’s important to understand that oftentimes a swollen lymph node is not due to lymphoma, but rather an infection. It is not unusual for doctors to prescribe antibiotics to see if the lymph node shrinks over a period of time. If there is no improvement in the size of the lymph node following antibiotic treatment, your doctor may move forward with a biopsy. However, if symptoms strongly suggest lymphoma may be present, your doctor may move immediately biopsy the affected node. Hodgkin’s Lymphoma is generally treated with chemotherapy. Radiation is sometimes used to “consolidate” the response to chemotherapy, particularly when only one or two sites are felt to carry significant chance of recurrence. Relatively small doses of radiation are used in this setting. The category of Non-Hodgkin’s Lymphomas contains several subtypes that are treated differently. Some subtypes are very slow growing, and they are sometimes followed by the physician without therapy. Other sub-types require moderately intensive or very intensive chemotherapy. As in Hodgkin’s Lymphoma, a moderate dose of radiation is sometimes used to “consolidate” the response to chemotherapy. Since lymphomas are relatively sensitive to radiation, radiotherapy is often used to shrink large tumors that are causing symptoms. This is done as a “palliative” measure, to control symptoms and improve quality of life. Are you ready to take the next step in your Hodgkin’s Lymphoma or Non-Hodgkin’s Lymphoma treatment? Contact our team of 30+ board-certified physicians to discuss your radiotherapy options. We are proud and honored to serve patients across the Southeast U.S. at our cancer treatment centers in Charlotte, NC and surrounding locations.